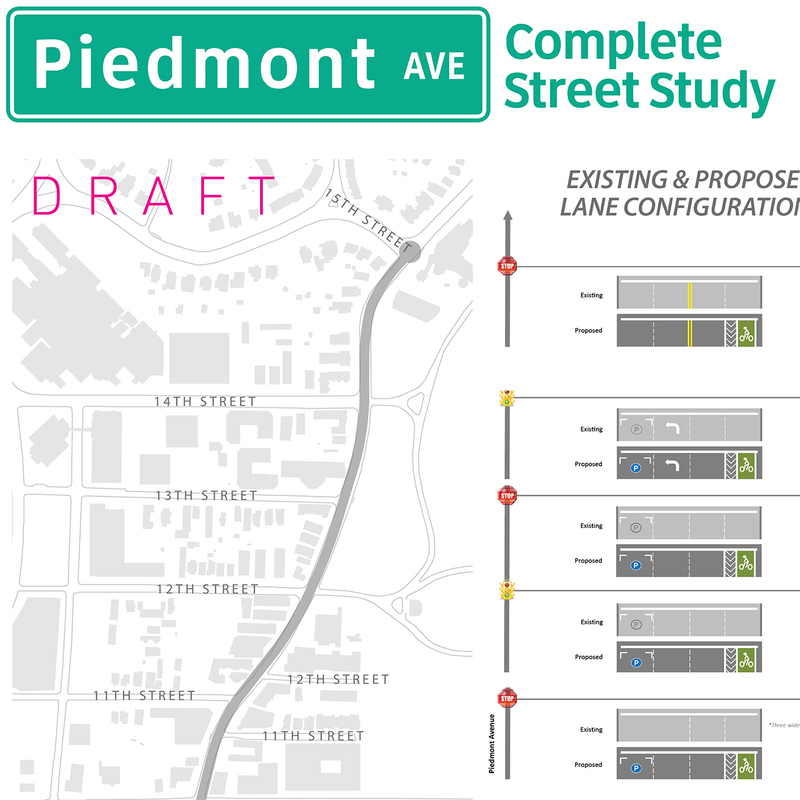 The photos above represent a “before and after” vision of Piedmont Avenue as imagined by the Midtown Transportation Plan. 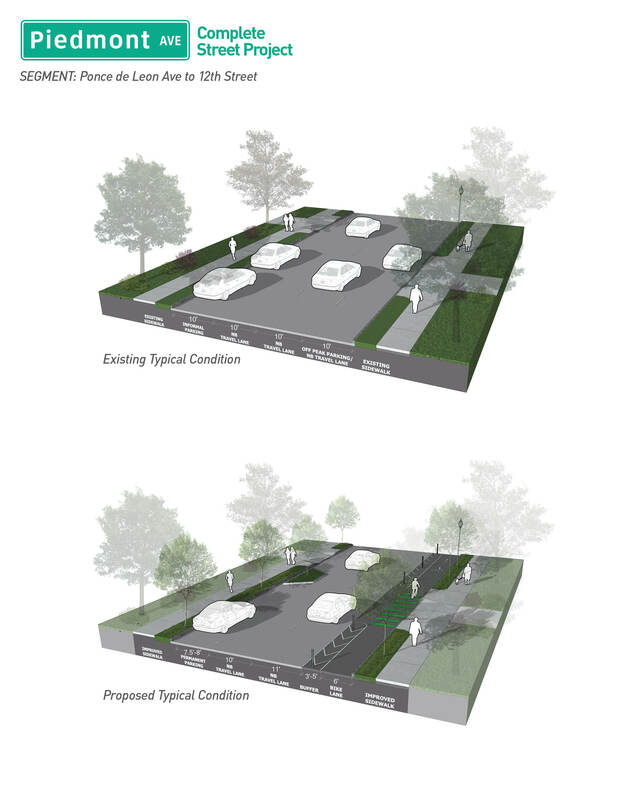 Specific alignments and materials may change as the design develops. 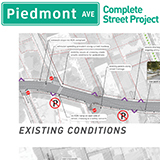 The City of Atlanta’s Renew/TSPLOST Program, in partnership with Midtown Alliance, is planning improvements to approximately 1.1 miles of Piedmont Avenue between Ponce De Leon and 15th Street. 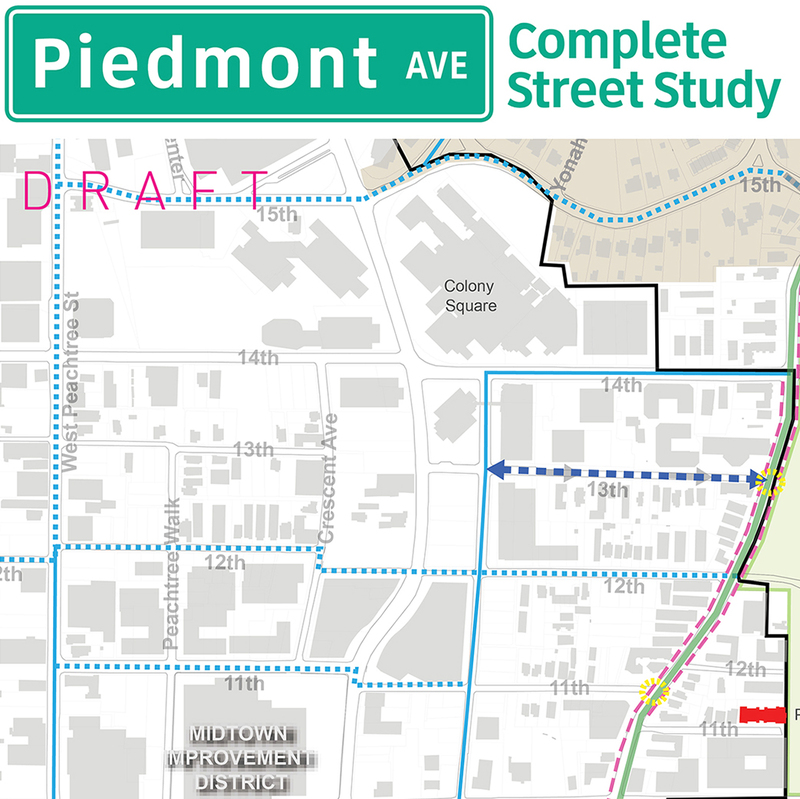 This corridor was identified for improvements in the Connect Atlanta Plan and identified as a “complete street” project by the 2015 Renew Atlanta Bond, as well as the Midtown Transportation Plan. 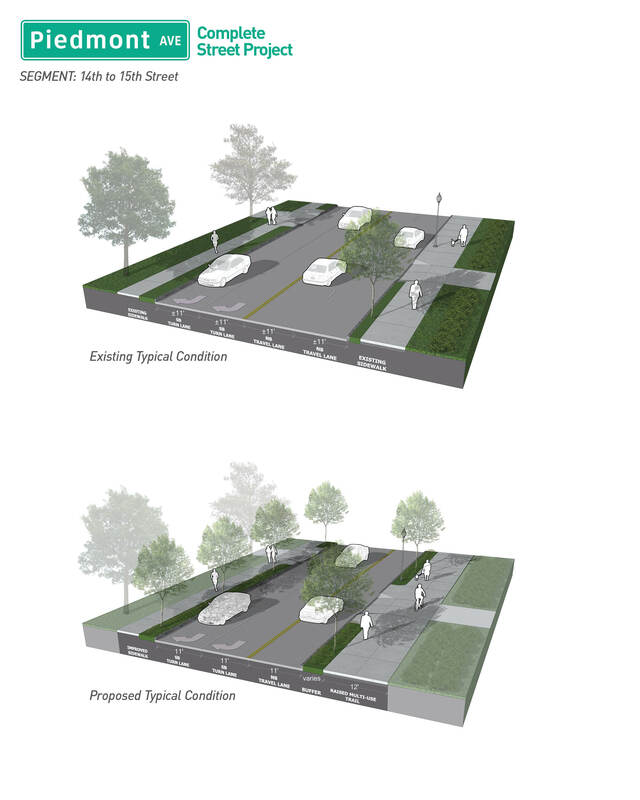 Complete street projects are intended to increase safety and accessibility for all street users, especially for people walking, biking, and with limited mobility. 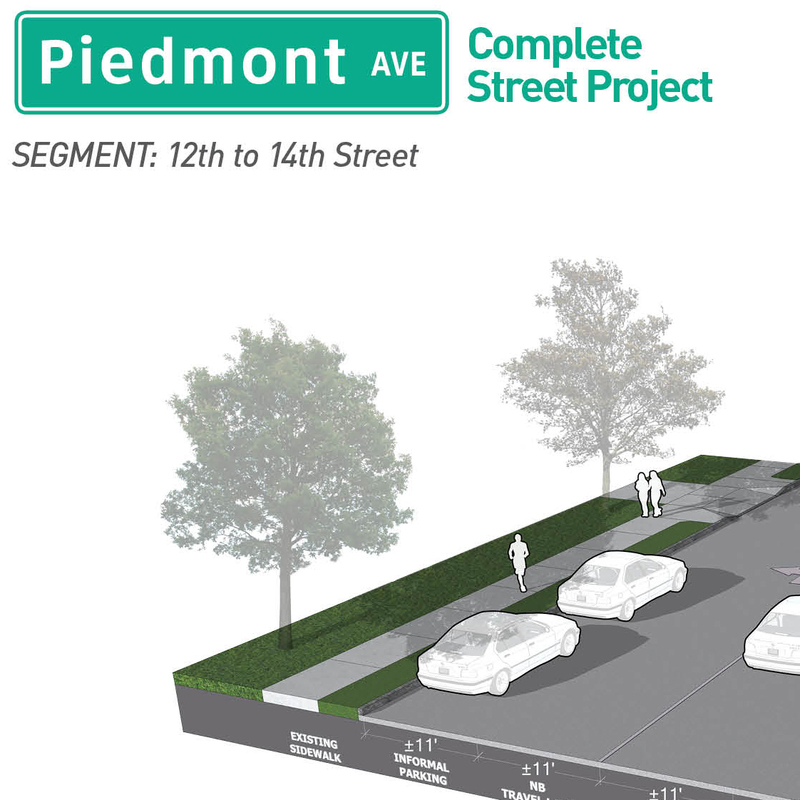 Replace the sidewalk on the east side of Piedmont between 14th Street and 15th Street with a multi-use path. 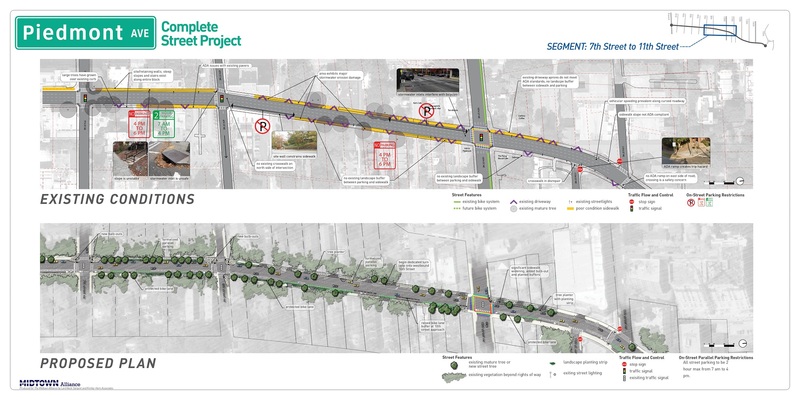 Conceptual planning began in November 2016 and was completed in July 2017. 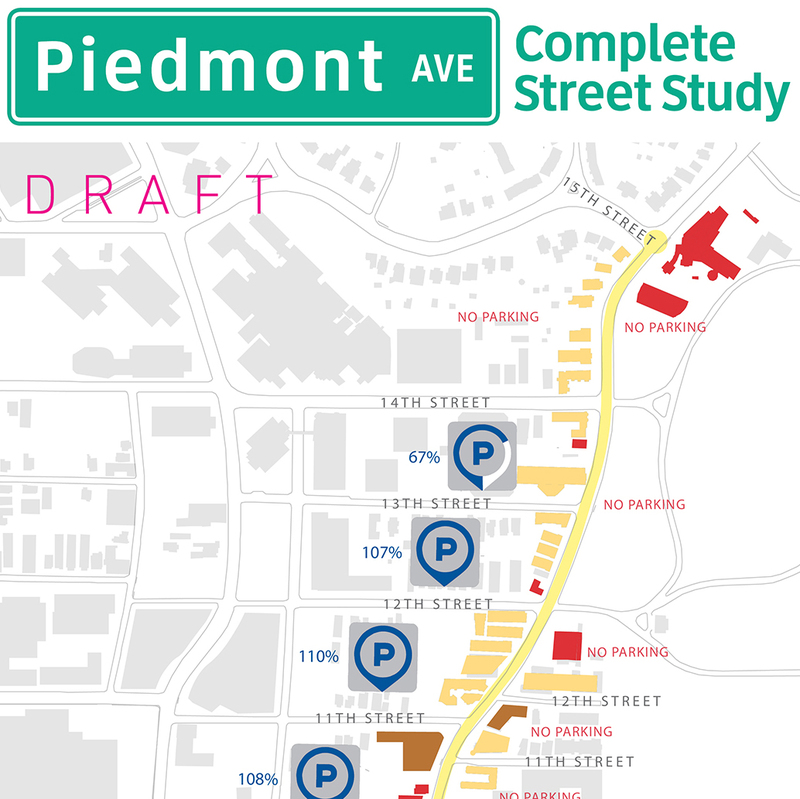 Concept planning included an inventory and analysis of existing physical conditions, a traffic study, and an analysis of on-street parking. 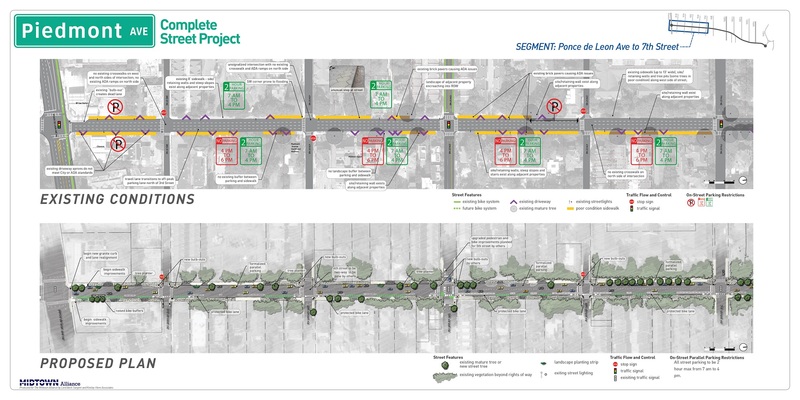 This assessment identified opportunities to address issues such as excessive vehicle speeds, challenges for people crossing the street, and a lack of connectivity in the city’s bicycle network. 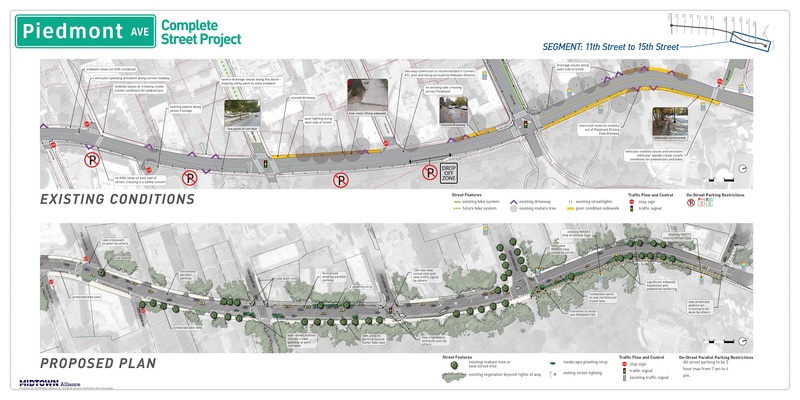 A public meeting was held in March 2017 to present initial conceptual plans and receive feedback and ideas from the community. 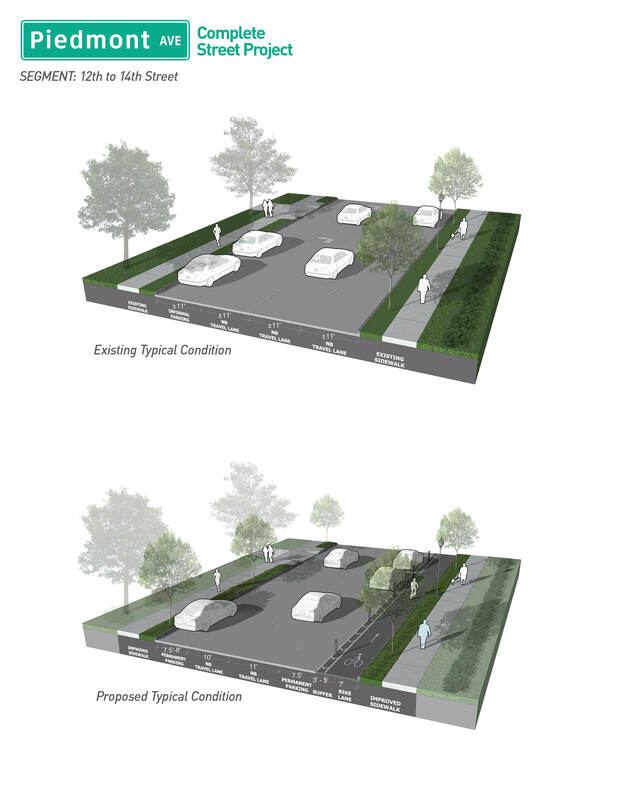 The completed conceptual plans and documentation of existing conditions are linked in the gallery below. For an overview of the March 2017 public meeting view the compiled notes here. The project is now in the design and engineering phase of work. This phase of work includes additional public and stakeholder engagement, development of detailed design documents, and the development of construction and bid documents. Detailed engineering and design work kicked-off in 2018. This phase of the project is anticipated to last approximately 12 months and will result in final construction documents by early 2019. 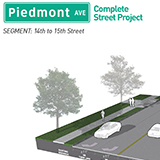 Subject to the availability of funding, construction of the Piedmont Avenue improvements is scheduled to begin in Fall 2019, with estimated completion by Summer 2020. 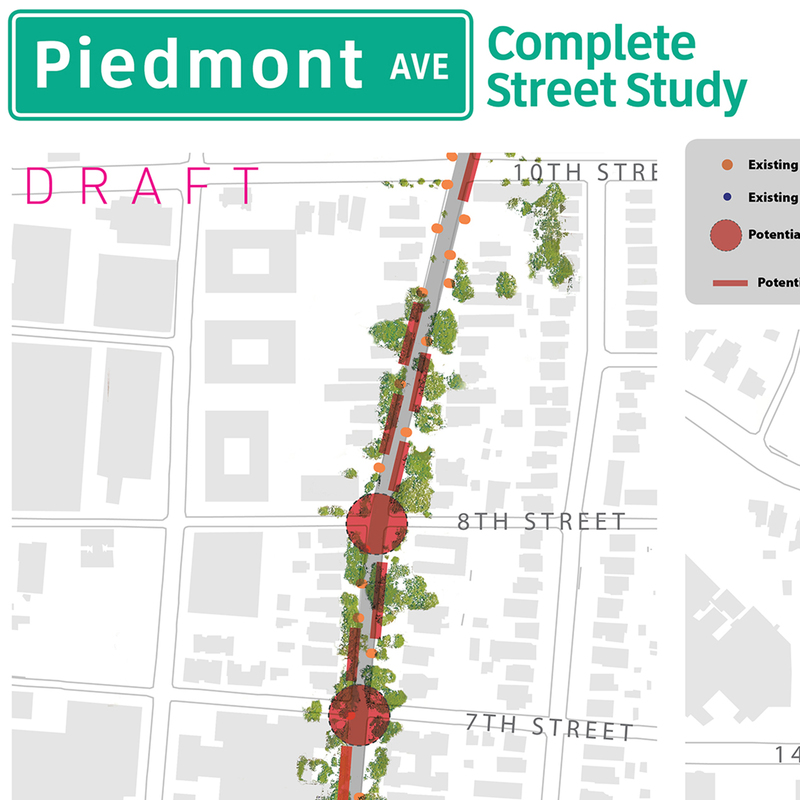 Midtown Alliance and the project team presented detailed design documents to the public in the summer of 2018. For an overview of the June 2018 public meeting view the compiled notes, here. For detailed responses to submitted comments and questions, please see the table, here. 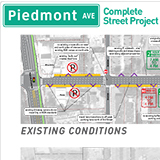 To view comments on the concepts, please click the project map below. 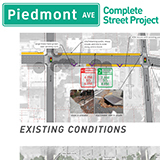 If you have comments or questions please email transportation@midtownatl.com.